We’d love your help. Let us know what’s wrong with this preview of Winners by Alastair Campbell. In the tradition of The Talent Code and The Power of Habit, Campbell draws on the wisdom of an astonishing array of talented people—from elite athletes to media mavens, from rulers of countries to rulers How do sportsmen excel, entrepreneurs thrive, or individuals achieve the ambitions? Is their ability to win innate? Or is the winning mindset something we can all develop? To ask other readers questions about Winners, please sign up. Winners by Alistair Campbell leapt off the shelf at a time when I was looking for some inspiration, how to get back on track and how to motivate my waning enthusiasm for my work. I could identify with his main points...objective, strategy and tactics. Alistair wrote in a very loose style, attempting to pull together personalities from the sporting and political field in his search for winners. Random examples became a little tiresome after reading half the book. However, he made some excellent p Winners by Alistair Campbell leapt off the shelf at a time when I was looking for some inspiration, how to get back on track and how to motivate my waning enthusiasm for my work. I could identify with his main points...objective, strategy and tactics. Alistair wrote in a very loose style, attempting to pull together personalities from the sporting and political field in his search for winners. Random examples became a little tiresome after reading half the book. "One of the most interesting people in Britain and this book is one of the most interesting about winners." (Gavin Esler). Attitude, resilience, crisis management, the right mindset, extreme mind, strategy, leadership and teamwork, all are key elements to make a winner. Alistair Campbell's analysis of what makes a winner tick is a handy manual for anybody who wants to have an extra edge professionally and personally. 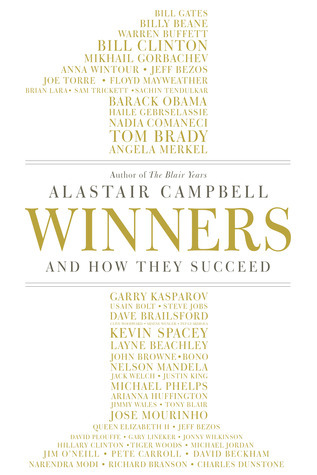 Alistair Campbell writes in his typical loose style with many examples from the w "One of the most interesting people in Britain and this book is one of the most interesting about winners." (Gavin Esler). Alistair Campbell writes in his typical loose style with many examples from the world of politics, media, sport and business. Campbell uses the term O.S.T. - Objective, Strategy, Tactics - the structure used to define your plan to success. The objective is likely to be fixed and very simple to define, strategy is what approach you'll take and is generally long term but must be communicated and brought up frequently to get everyone pulling in the same direction. Tactics on the other hand are the actions required to implement the strategy at any given moment in time, they are likely to change quite often and must take changing factors into account. As Benjamin Franklin once said 'by failing to prepare, you are preparing to fail.' The fundamental thing i have learnt is pay attention to detail a classic trait of any winner. 1. O.S.T. - Objective, Strategy, Tactics - the structure used to define your plan to success. The objective is likely to be fixed and very simple to define, strategy is what approach you'll take and is generally long term but must be communicated and brought up frequently to get everyone pulling in the same direction. Tactics on the other hand are the actions required to implement the strategy at any given moment in time, they are likely to change quite often and must take changing factors into account. 2. A winning mentality is not just about preparing well, paying attention to detail and building a strong team but it's about bouncing back from setbacks and learning from every mistake and failure you experience. That's what defines a real leader and a real winner. Although it's probably more of a 4 star book on my rating scale, I'm giving this five stars for the ambition of Alastair Campbell in looking at common characteristics for winners in business, politics and sport, three very different spheres, and also for some of the insights he has extracted from those he has interviewed. As you would hope from a communications guru, the book is clearly constructed with simple messages, but illuminating and interesting too. It's definitely a book I'll be referrin Although it's probably more of a 4 star book on my rating scale, I'm giving this five stars for the ambition of Alastair Campbell in looking at common characteristics for winners in business, politics and sport, three very different spheres, and also for some of the insights he has extracted from those he has interviewed. A phrase I find myself using a lot now is 'History is written by the winners' but I fought to approach this with an open mind for two reasons: firstly, that I think the saying is largely true, and secondly, it was written by Alistair Campbell, a successful but thoroughly detestable figure. I don't think I was converted on either count but Campbell uses his contacts well to get a lot of interesting profiles, but is let down by an acceptance that their word is Gospel, and in a bid to make himself A phrase I find myself using a lot now is 'History is written by the winners' but I fought to approach this with an open mind for two reasons: firstly, that I think the saying is largely true, and secondly, it was written by Alistair Campbell, a successful but thoroughly detestable figure. I don't think I was converted on either count but Campbell uses his contacts well to get a lot of interesting profiles, but is let down by an acceptance that their word is Gospel, and in a bid to make himself the story, tries to prove that everyone wins by his 'OST' mantra. The book's strength comes from interviews with winners from a range of fields, from politics, sport and business, which works both ways. On the one hand, we should get a genuine insight from figures such as Jose Mourinho, Haile Gebrselassie and Sir Charles Dunstone. On the other hand, Anna Wintour and Richard Branson get to put out their brand unchallenged, with the former dismissing claims of how she got ahead in her career and the latter promoting Virgin almost as a service that just gives people what they want, rather than a business which exists to make a profit. Campbell opted to go for themes first, then to fit the profiles amongst them, and his key themes could pretty much be boiled down to 'OST' and 'work hard'. OST is 'objective, strategy and tactics', and an interesting approach to succeeding, but Campbell tied himself in all sorts of knots to prove the validity of this theory, especially when challenged by Mourinho. This was quite revealing, as Mourinho is famously a reactive manager, whose tactics are his 'strategy', and as Campbell tried to fit this to his threory he contradicted his earlier claim that strategy has to come before the tactics. Without a shred of irony, Campbell later discusses how winners are always prepared to learn from their mistakes and challenge their misconceptions. We also learn you have to 'work hard' which obviously is needed to succeed, but the implication is that with hard work and a clear objective you too can win - when surely rivals of Team Sky also had the objective to win the Tour de France? Surely the Conservative party also had the objective to win the 1997 General Election? This is the crucial problem with most analysis of winners, looking at what they do and assuming that's the winning formula. But the key test is to look at the losers as well and ask what is different about them. Nick Faldo and Ian Botham may well have had the extra drive to succeed when told by a careers advisor to look at a proper sport, but what about the footballers who work hard, get dropped at 20 and have no qualifications? Surely some of those had drive too? I knew someone who was determined to prove his doubting teachers wrong and get to Oxford, and didn't. Campbell later talks about Usain Bolt, who freely admits to having a few more freedoms in his training regime, but he was still the best, and proves that, actually, the only way we can prove we're winners is by winning. But you can't market a self-help book like that. It has many useful ideas and strategies explained largely through the medium of various 'winners'. However, it is far too long by half. The same points could have been made as effectively but much more concisely. I was looking for a positive book to read at the beginning of the year and this fit the bill exactly. By no way it offers anything new but helps in getting our thoughts structured in suggesting OST. But I found it a bit lengthy and repetitive beyond a point. One of the most inspirational books on success I've ever read, offers incredibly good and relevant advice to excel in whatever one decides to set one's mind on. Especially relevant for me during the transitional period of my career. Great book to read. OST can be applied to many walks of life without a complicated approach. I love sports and could relate to many of the sporting examples used in this book. I'd recommend reading it. Fantastic book, highly recommend to anyone that really wants to know,what it takes to be a winner. Very insightful. Read it now. Great book. Cambell interviews the top people of their fields, business, management, sports etc. and gives an analysis of their success. Easy read and addictive read. Very inspiring. Interesting concept; much too long. Should have been edited more thoroughly. If you can't win, then what's the point. Throughout the book, I found that one of our everyday question each time we wake to set out in our endeavours is how we are going to win, and Alistair uses winners in sports first, business and politics to show how these people have done it. Having a strong winning mindset, thinking you will win and working hard towards winning is part of that formula for anyone. Motivational and inspiring stories from successful people and elaborated reasons and rules for why they succeed. Interesting to read but I was personally a bit annoyed by "I know it all and my opinion is the best " approach to the writing. IS THIS BOOK FOR ME? If you are looking for a motivational book, you can give it a try. But I honestly think there are plenty of better books that fall into this category. I have a very odd relationship with Alastair Campbell. I am thankful that he is on the progressive side of politics, but I also know that to enable Tony Blair's victory, Campbell pretty well destroyed the British Labour Party. So his interpretations of winning, losing and success will always be bittersweet. Also, it is impossible to read his stylistic excesses without summoning Peter Capaldi's re-interpretation of Campbell in the brilliant similacrum of New Labour in The Thick of It. Therefore, I I have a very odd relationship with Alastair Campbell. I am thankful that he is on the progressive side of politics, but I also know that to enable Tony Blair's victory, Campbell pretty well destroyed the British Labour Party. Therefore, I was not expecting to be impressed by this book. I was worried it would be a bit self help, a bit 'believe and achieve' pseudo-management consultant nonsense, or a bit new age guru with visualization techniques in tow. The book has elements of those tropes, but it is convincing, well written and motivating. The reason for this success is that it focuses on the people - the Winners - rather than the strategy - Winning. The people he selects are interesting, evocative and compelling, except Shane Warne who needs to be placed in a cone of silence for several decades. I listened to this audiobook thanks to an app called Blinkist. Winners come in all shapes and sizes. While winners share certain traits, such as boldness or innovation, their ability to beat the competition is also a result of the teams they build and their focus amid crises. When dealing with a crisis, be honest. If you find yourself in the middle of a crisis, you might feel like closing your eyes and wishing it to disappear – or worse, pointing the I listened to this audiobook thanks to an app called Blinkist. If you find yourself in the middle of a crisis, you might feel like closing your eyes and wishing it to disappear – or worse, pointing the finger at someone else. These are not the best solutions and certainly not the easiest. Instead, do something radical: be honest. Campbell brings a lot of clarity of thought to the essence of great leadership and I learned a lot from this book. The best chapters are the early ones where he shows that winners are crystal clear on their objectives, strategy and tactics, and that they don't muddle the three. The examples are mostly from UK sport, politics and business over the last 25 years, which made reading highly enjoyable as well as interesting. This book prompted me to think more about my own business and own leadership Campbell brings a lot of clarity of thought to the essence of great leadership and I learned a lot from this book. The best chapters are the early ones where he shows that winners are crystal clear on their objectives, strategy and tactics, and that they don't muddle the three. This book prompted me to think more about my own business and own leadership style than anything else I've read recently. It also gave me ideas for improvement. While at times it does tend to be steeped in politics – a given due to the fact that the Author was the director of communications and strategy for former Prime Minister Tony Blair – the author does a great job with the flow of the book and not 'fluffing'. Drawing on successful people from all walks of like - athletes, football managers, politicians, businessmen and women - he presents the key strategies and traits he's found all 'winners' have in common and how to apply them to Very good read. Very interesting inside stories of various successful people. You may not like all those characters but definitely there are things to learn from every one of them. Many analogies between sport, business and politics. My american friends sorry but there are many example from European football which maybe harder to relate to. One of the few books I would go back to and read again. Very insightful look into various different sectors - politics, sport, technology, entertainment, fashion - and the characteristics that the cream of the crop in each field share and set them apart from the rest. Chapter on Visualisation was particularly interesting. Overall, very inspiring and motivating, with techniques and changes in mindset that can be applied to my own life to make those 'marginal gains'. A breeze to read since it's very easy to skip over passages you're not so interested in while easy to engage in ones you are. This is because Campbell makes obvious shifts from sports analogies to political ones (and any other he deems fit) so it's easy to pick and choose what appeals to you most. Really insightful but bite-size lessons which will allow you to take what you know, assess it and reevaluate if need be. Will definitely read again. I had to put this book away once I read up on the author. I know I know, how unfair and uneducated of me but I struggle to feel bad about it in the light of recent events. Also interviewed crowd. From bad to worse. I gave up around reading Floyd Mayweather's quotes. Hasn't he battered his girlfriend?? Tony Blair - war cryminal, Anna Wintour - fur advertising evil cow.. do we need to be bad to be successful? I don't think so. The concept of the winning attitude at the beginning is clear and interesting. I like the part of Jose Mourinho the most:)When it goes to the middle, the books gets boring and repetitive. It is recommended for authors to make elaboration of how the featured person achieve success, instead of making a lengthy list of examples.